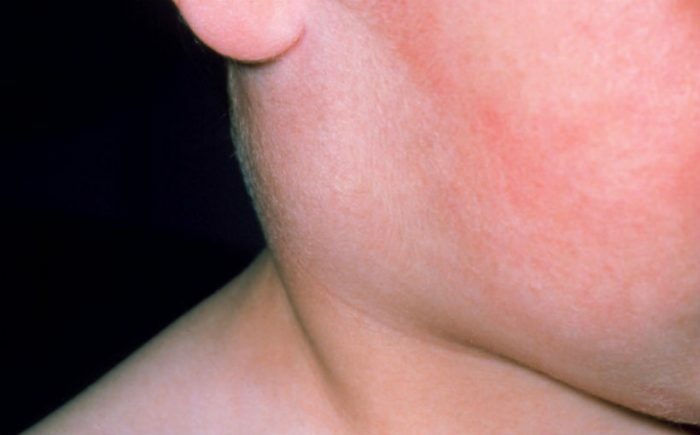 Mumps is a disease commonly found in young pediatric patients. Although children are primarily affected by this disease, adults can also be impacted. 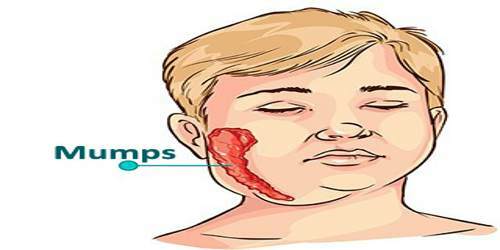 Mumps is caused by a virus which further causes the saliva glands to swell. The salivary glands are also known as parotid glands and are located below and ahead of each ear. The virus is spread by contact with the sneeze or cough of the infected individual. Humans are the natural hosts for this disease. This disease is more severe if one gets it as an adult. On account of universal immunization in childhood, the US sees less than 1000 cases of the disease annually, in most years. The reported cases are generally of kids aged 5 to 14 years. The infection is common during spring and late winter. 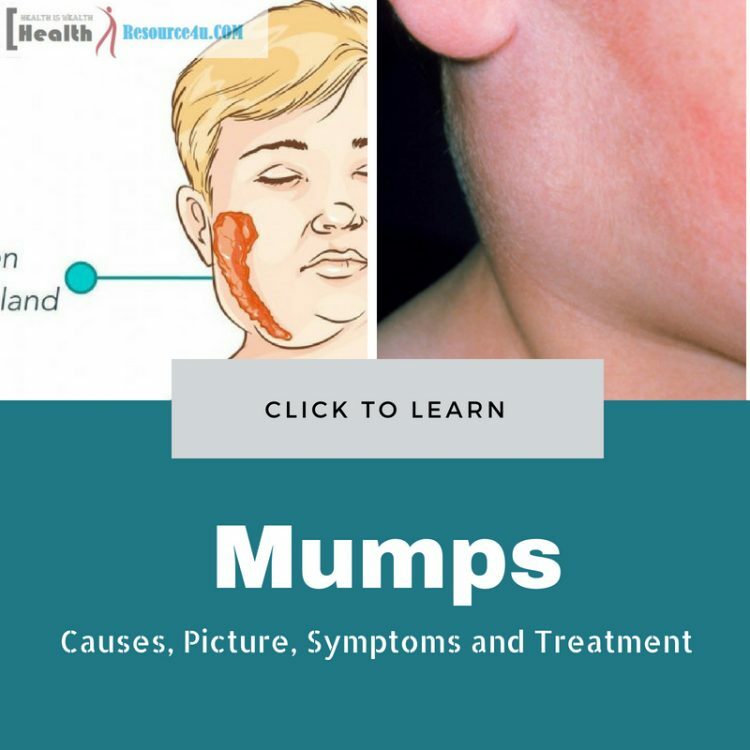 Mumps is caused by a virus specifically, and the incubation period right from the initial infection to the symptoms ranges across 16 to 18 days and generally ranges across 12 to 25 days post the exposure. There is a period when a person who is suffering from the disease is most infectious to others. It ranges from 1 to 2 days before and 5 days following the onset of gland inflammation. Early symptoms are not common. But these can occur and range from fever to a headache, loss of appetite and aches. Moderately high fever lasting for 3-4 days also takes place. The swelling of the gland begins under and ahead of the ear on one side and progresses to the other rapidly. Swelling lasts from 7 to 10 days. Consumption or ingestion of acidic/citric foods causes a lot of discomforts. Symptoms may also include testicular pain in men. Other symptoms range across abdominal pain, stiff neck, seizures and problems in swallowing. One of the biggest complications of mumps in males is orchitis or inflammation of the testicles. Certain individuals impacted by the mumps virus show no symptoms or signs or very mild ones. When symptoms and signs do take place, they appear within 2-3 weeks of exposure to the virus and range across a variety of signs and complications. Parotitis or swollen salivary glands are not the only symptoms of mumps though it is the chief one. Then, there is fever, headache, muscle ache, weakness as well as fatigue, appetite loss, pain or problem while swallowing or chewing. Sometimes, mumps also leads to the swelling of the meninges, pancreas or ovaries. Once an individual has mumps once, he or she cannot get the infection again and is immune to it. While mumps is contagious, around 20 percent of those with this virus show no symptoms. Vaccination is an option for safeguarding yourself against this disease. Dehydration and inability to keep fluids down. Symptoms of mumps usually occur within 2 weeks of virus exposure, with flu-type symptoms being the first to appear, including body aches, fatigue, headache, appetite loss, and low-level fever. Over the next few days, a higher fever of 103 degrees F or 39 degrees C and swelling of the parotid glands follow over the next few days. The glands do not swell all at once. They may become inflamed and pain periodically. The flu-type symptoms which appear range across nausea, body ache, headache, general fatigue, and it is only in the later days that classic mumps symptoms appear. The main symptom is the swelling of the parotid glands, one of the 3 sets of salivary glands. Other associated symptoms include pain in the side of the face when swollen, pain while swallowing, fever up to 103 degrees F, dryness of the mouth and pain in the joints. Adults may rarely contract mumps. In such a case, symptoms are alike but slightly worse and complications can result. Non-specific symptoms include a headache, muscle aches or myalgia, low-grade fever, malaise, and reduced appetite. This generally occurs during the first two days of mumps infections. The swelling of the parotid gland is present on the third day of the illness. The parotid gland is located anterior to the ear above the jaw’s angle. The parotid gland is swollen and tender. Referred ear ache may also occur. Parotid gland swelling lasts up to ten days; adults experience more intense and debilitating symptoms than children. Close to 95% of individuals developing mumps symptom will experience tender inflammation of parotid glands. Close to 15 to 20 percent of mumps cases lack clinical evidence of an infection; around 50 percent of patients will have non-specific respiratory symptoms. Adults are most likely to undergo sub-clinical or only nonspecific respiratory symptoms types while children aged from 2 to 9 years are more likely to experience classic mumps symptoms. Mumps is generally diagnosed when the child or the adult patient has inflammation of the parotid gland on one or other side. The patient may also have fever and glands tenderness just under and in front of the ears. The diagnosis of mumps requires a clinical acumen. Lab studies are carried out to support the clinical impression. The purpose of these studies is to exclude other viruses that offer a similar clinical presentation and exclude other similar presenting symptoms and maladies. Mumps is a problematic virus. It is a single RNA strand virus encased inside a 2-layered envelope that provides the virus with its characteristic immune type signature. Only a single type of mumps virus has been found to exist, in contrast to many virus types impacting the common cold. Mumps is also contagious and more so, on the higher end, like influenza and rubella or German Measles. It is less contagious than measles and varicella or chickenpox. It is transmitted from one human to another. Mumps spreads rapidly among members living in close proximity to each other. The virus is commonly spread from one individual to another through respiratory droplets expelled during coughing or sneezing. The respiratory droplets less frequently may land in the sheets, clothing or pillows and be transmitted through hand-to-mouth contact after these items are touched. Animals cannot contract or spread this disease. There is a 14 to 18 day period between the contracting of mumps virus and the onset of signs and symptoms. Viral shedding is a temporary process and patients should be kept away from those in danger of contagion to it for the first 5 days following the inflamed salivary glands. 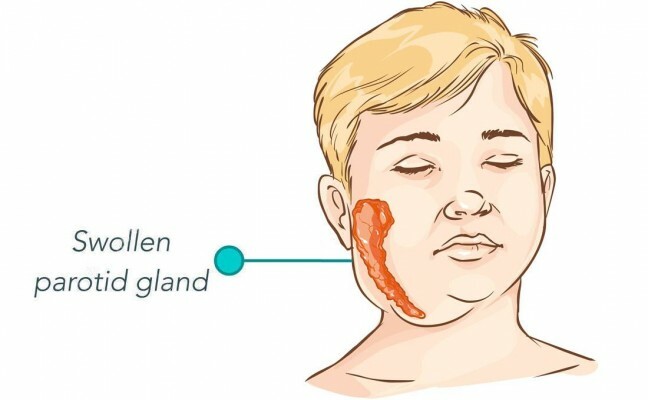 The highest possibility is of mumps spreading over a period of 2 days before the symptoms onset and the first 5 days of parotid gland tenderness and swelling. The mumps virus itself can be transmitted through respiratory secretions from the impacted patient. When mumps is contracted, the virus traverses the salivary gland’s respiratory tract and reproduces, causing the swelling of glands. Examples of how mumps can spread the contagion include coughing, sneezing, sharing food or drinks with the infected person or even kissing the infected patient. An infected patient can also touch their mouth or nose and pass the infection onto the surface which another individual may touch. Individuals impacted by mumps virus are contagious for 15 days, and this includes 6 days before symptoms start to show and 9 days after they commence. The mumps virus belongs to the paramyxovirus, a common cause of infection impacting children. Such complications are more frequent in adults. The most common complications among these include Orchitis or the testicular swelling that becomes painful. This occurs among one in 5 male adults with mumps. The swelling subsides in around 7 days; tenderness can last longer. This complication can cause infertility. Oophoritis is when the ovaries become swollen and painful. This takes place in one in 20 female adults. The swelling subsides as the immune system fends off the virus. This sometimes causes infertility. Viral meningitis is one of the rarest common complications. It takes place when the virus spreads across the bloodstream and impacts the body CNS which includes the brain and the spinal cord. Swollen pancreas or pancreatitis also results; here pain is experienced in the upper abs; this takes place in one of 20 cases and is generally mild. If a pregnant woman has mumps in the first 12 to 16 weeks of pregnancy, there are increased possibilities of miscarriage. Rarer mumps complications include encephalitis and hearing loss. Encephalitis is when the brain becomes swollen leading to neurological issues. In certain cases, it can be lethal. There is a rare risk factor here; this complication impacts one in over 6000 cases. Hearing loss is the rarest complication impacting one in 15,000 cases. Mumps treatment is mainly carried out for symptom relief. Doctors advise mumps patients to drink a lot of liquids and eat well. The diet needs to be light. Pain relief medications other than aspirin may be used for giving comfort. For many children, the gland’s swelling goes away in a period of 7 days. A child with mumps should not come to school or daycare for a period of 9 days after the salivary gland swelling. Mumps can be treated through OTC pain relievers for countering inflammation and fever. The child should be well hydrated so that he or she can also drink liquids. Nowadays, there exists a combined vaccine called MMR or measles, mumps and rubella which is used for immunizing kids against the disease. Most kids recover without serious mumps complications. While mumps infection during the first 3 months of pregnancy increases the rate of spontaneous abortion, there is no evidence it raises the risk of birth defects. The rare complications include arthritis, inflammation of the heart, deafness, encephalitis, meningitis, and pancreatitis. Mumps is a highly contagious viral infection. It has an incubation period of 14 to 18 days from exposure to onset of the symptoms. The disease duration is 7 to 10 days. The MMR vaccine provides 88 percent effective immunity against mumps following a 2-dosage schedule of 12 to 15 months with boosters at ages 4 to 6. A single mumps vaccine protects 78% of those injecting it against the disease. While no specific treatment for mumps is there, warm or cold packs for parotid gland tenderness and swelling are extremely helpful. There are also pain relievers such as Tylenol and ibuprofen. Risk factors for mumps include failure to completely vaccinate through 2 separate doses with those exposed to mumps. The highest risk of mumps contraction is between 2 to 12 years of age in a child. The outbreaks are more likely during either winter or spring. Mumps is also more likely to happen while visiting high-risk areas like Africa, the Indian subcontinent and Southeast Asia where low rates of immunization exist. Additionally, mumps is more likely for those with weak immune systems due to diseases like cancer and AIDS or medicines like oral steroids for prolonged use and chemotherapy. Most mumps cases are not complicated and can be managed by family GP, pediatricians, internists. A specialist may be contacted for unusual circumstances or medical complications. Drinking a lot of fluids may ward off symptoms. As mumps is viral, antibiotics cannot be used for treatment. Additionally. There is no anti-viral medication for treating mumps. Present treatment can relieve symptoms till the infection runs its course and the body immunity builds up, like that of fending off colds. In most circumstances, individuals recover within 2 weeks. Consuming plenty of liquids like H20 can be beneficial, though fruit juices must be avoided as these stimulate saliva production and cause pain. Placing a cold or warm pack on the swollen area can also help. Chewing may be painful, so eating liquid or mushy food is the best bet. Get adequate sleep and rest. You also need to gargle with warm salt water and take OTC painkillers. While mumps can be detected through physical examination alone, the inside of a person’s mouth may also be examined. This is because the tonsils are generally pushed to the side when a person is infected by mumps. Other tests for diagnosis may include checking if the patient has a fever and carrying out blood, urine or even saliva tests to confirm the diagnosis. A sample of cerebrospinal fluid may also be taken from the brain for testing. This is generally only in severe cases. For the prevention of mumps, the MMR mumps vaccine is the best bet. It can come on its own or as part of the MMR vaccine. This vaccine also defends the body against measles and rubella. This vaccine is given to infants over 1 year of age and as a booster before commencing school. The mumps vaccine is routinely given to kids in over 82 nations. Many of these countries have also eliminated encephalitis and deafness due to mumps. Adults can be given MMR at any age. The doctor may prescribe MMR vaccine for those traveling to India, Africa, Japan, Pakistan, Southeast Asia in general. Others may be asked to take the vaccine if they are working in healthcare facilities like hospitals and clinics. Also, those working where there are lots of young people like colleges and schools may also be required to take the vaccine. Additionally, if the patient is suffering from diseases that cancer that weaken the immune system, the doctor must be contacted and consulted before the vaccine is administered. In case the immune system has been seriously compromised, the patient has an allergic reaction to antibiotics like neomycin or gelatin, and the patient is pregnant, MMR vaccines may be avoided. Most individuals who are given this vaccine do not face side effects; the symptoms of the disease cannot be contracted from the vaccine. A smaller percentage develops rash, fever and joint pain. Less than 1 in a million suffer allergic reactions on account of MMR vaccine. Numerous precautions can be taken to help prevent the spread of infection. This includes washing hands with soap and water on a frequent basis. Not commencing with school or work until 5 days after symptoms is another precaution. Infected patients should also cover the nose and the mouth with a tissue while coughing or sneezing. As mumps is a virus, it does not respond to medications like antibiotics. The symptoms can be treated to make oneself comfortable while combating sickness. This includes resting when one feels tired or week. Taking OTC pain relief medication can also bring down the fever and swelling. Besides soothing swollen glands through the application of cold and warm packs. Drink a lot of fluids to avoid fever-based dehydration. One must consume a soft diet of yogurt, soup plus different foods that are not difficult to chew. Chewing may be difficult when the glands become inflamed. Avoid acidic beverages and foods that lead to pain in salivary glands. A virus culture or a blood test may be required to make the antibodies to fend off infection. The blood test can detect systemic antibodies that fight off the mumps virus. Mumps is caused by a virus but has relatively few complications in a general course. If an adult or a child has mumps, rest and time are the best treatments. It’s important to rest until the fever goes away. Isolating oneself to prevent the spreading of the disease is important. While taking OTC pain relievers, avoid aspirin as it is related to Reye’s syndrome. Diet-wise, you need to avoid foods that require a lot of chewing. Instead, one needs to choose broth-based soups or soft items for nourishment. Avoiding sour items like juices or citrus fruits which stimulate the production of saliva. You also need to drink a lot of fluids. Children who suffer from this disease need immediate medical care when there is a fever of 103 degrees F, a problem in drinking or eating, disorientation or confusion, abdominal pain, and orchitis. Call your doctor if an adult or child patient displays these symptoms. Pre-appointment restrictions should be noted. It is also important to consider symptom history, recent exposure to possible infection sources, key medical data and questions to ask doctors. What signs and symptoms have been noted? What is the treatment approach recommended? What are the steps taken to reduce the risk of infection to others? What are the possible causes or signs and symptoms? Is the adult or child patient contagious and for how long? How fast should symptoms improve? Are home remedies/self-care steps in place to relieve symptoms? When were these signs and symptoms noticed? Have the symptoms worsened over time? Do symptoms include pain in any body region? What are the signs and symptoms common to mumps within the last weeks? Has the patient been vaccinated? Is the patient being treated for any other medical conditions? vitamins or supplements are needed? Is the child suffering from mumps in school or daycare? 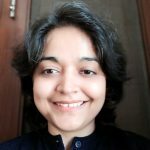 Is a pregnant lady/breastfeeding mother suffering from mumps? Resting as much as possible and avoiding contact until the doctor is seen is important. Mumps is contagious within the first-week post the appearance of symptoms. Mumps is generally a mild disease. Tough complications can occur during the period such as encephalitis, meningitis or permanent deafness. The child’s pediatrician needs to be called if the young patient has a severe headache, disorientation, high fever, and a stiff neck. Before taking the MMR vaccine, a doctor should be consulted, especially if pediatric patients had seizures in the past or parents and siblings have suffered from epilepsy. The patient may also be having a blood disorder, allergy to MMR or taking medication contraindicated, so these must be considered and consulted with a medical practitioner before vaccination.